I’ve had a week-long trip to the legendary Rainbow Lake in France booked for almost two years. I was counting down the days to going when only a week before the off, Chris Felton, who I was to share the trip with, had an unfortunate car accident. Thankfully, he only had whiplash but it put paid to his trip as he couldn’t move without pain, so had to sit this one out. I was gutted for him but as with all Rainbow trips it didn’t take me long to get a replacement. Oli Davies from Nash was quick to fill his place, and with this being his first-ever trip to the lake he wasn’t sure what to expect. Like all of my recent Rainbow excursions, I’d got my place via one of Rob Hales’ bookings. Rob sadly couldn’t make the trip either but we had some good company in the group, including venue stalwarts Dave Treasure and Neil Snowy, who we met up with in the nearby village of Hostens on the Friday night. The four of us were to share similar water, with Dave and Neil in peg 11 and Oli and I in the bordering peg 6. I’d never fished the peg before but I knew it had good autumn form so we were at least going somewhere with a chance of action. When we pulled up to the lake on the Saturday morning we were met with a few solemn faces. It had been fishing moody and, although a few decent fish had been caught, it sounded like it wasn’t being its normal self. The best fish out had come from the usually quiet peg 9 where one angler had caught two 70s on his last morning. Our swim had been slow with only a couple of fish during the week but, with peg 9 not being too far away, we remained optimistic as we knew we weren’t too far away from fish. At 10.30am we were given the okay to go to our swim from the owner Pascal. We had plenty of water available to us, approximately 10-acres or so, which is a good piece of the mighty venue. The most obvious feature was a long cigar-shaped island splitting pegs 7, 8, 9 and 11. Dividing this from the actual swim was a series of smaller islands on the left and, to the right, we had the channel running down to peg 5, as well as a series of bays which led to the famous Chocolate Box in front of peg 11 – one of the most productive features on the lake. The water was very much lower compared to previous visits, at least two foot down, which closed off the main channel leading to the Chocolate Box. With the water being so low we could see a series of bars running through the middle part of the swim. These looked to be a good focal point as there were fish showing there as soon as we walked into the swim. I also knew from talking to others who’d fished there previously, the two furthest channels, running closest to the cigar island and out into peg 11, were known to be the best spots. Both channels served as a main access route for the fish moving from one end of the lake to the other. With me having first choice, I decided to go for the right side as I liked the variety of options it had available. I could easily spread four rods out onto their own features, without them interfering with each other. I also had a fond acquaintance with the channel to the right as that’s where I caught Eric’s Common from on my last visit to the lake in May 2015. Oli was happy with the left side as he had a lovely channel to his left and plenty of options at both close and long range in front of him. Rightly or wrongly I’d gone to the lake with a preconceived idea of how I would tackle things. Having been there a few times in the past I knew the fish absolutely loved a good spread of boilies and particles. It was a combination I’d done well with almost every time I’d fished there. The plan was to find my spots and sit on them for a few days before the fish moved in and I’d start to catch. The first couple of days were always slow for me when fishing like this at Rainbow, but I had confidence in it picking up towards the middle part of the week. Oli on the other hand, was new to the venue and had his own style of fishing which he wanted to try. This involved fishing for one bite at a time – quite the opposite of my approach. He decided to find his spots and bait each one with a handful of free offerings and nothing else. We both spent several hours on the Saturday getting to know the swim. I decided to focus on the middle part, especially the series of bars running towards peg 11. The water dropped nicely to 11ft between all of the bars, with the bottom being nice and choddy in the deep channels. I donked the leads onto the edge of the deepest parts where the drop was much firmer, baiting each one with approximately 5kg of feed. Oli focussed his attention on similar depths in the channels leading towards peg 7 on the corner of the cigar island. He also put a rod down the channel to his left. We were both happy with what we had out in front and remained optimistic for the week ahead. Oli was armed with his cameras and hoping to get some film to upload to Nash TV. A fish or two would add to the footage, which I assured him looked promising from what we’d seen whilst setting up. 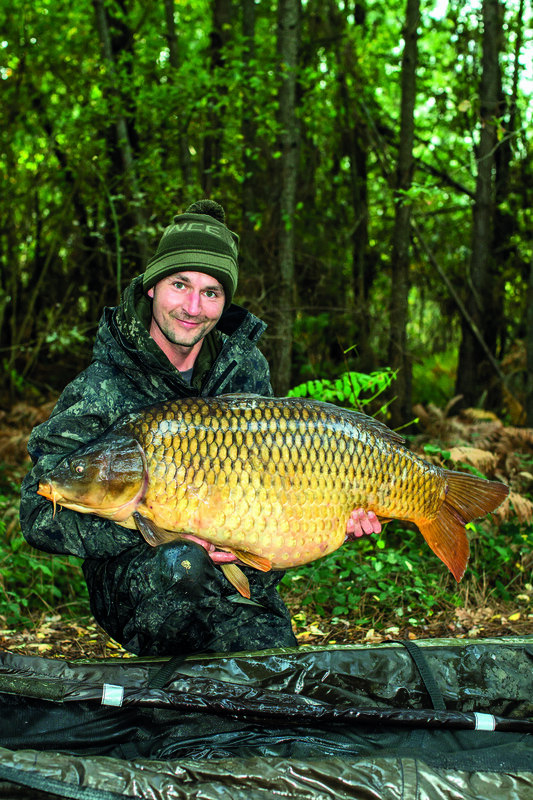 There had been at least half a dozen good carp shows in the main body of water so we knew there were fish about. The first night passed by quietly although we did hear fish in front of us. The Sunday remained quiet too and, by the Monday, Oli was getting itchy feet. He reminded me of myself when I first started fishing with Steve Briggs nearly twenty years ago. I was always trying to make things happen rather than sitting patiently like Steve, who was waiting for the biggies to arrive. I could very much relate with Oli as he lives a busy life and prefers to work his rods rather than sit watching. I tried to assure him it would all come good in the end, but when fish started bubbling up on the close-in bars, it was too much to resist and he dropped one on them. I honestly thought Oli had made the wrong decision when he went chasing the fish, as I’d seen many fail on Rainbow doing exactly that. A few hours later, however, I was chuffed to see his right-hand rod spring into life with a lovely 40lb-plus common on the end! It was a great piece of angling and the start of a nice run of fish for him. Whilst he was out in the boat netting the fish, one of his other Sirens let out a couple of bleeps before bursting into life with a much better fish on the end. I filmed the whole battle for him and when I saw a massive common roll in front of the net it was a great moment to share. He’d thoroughly deserved the fish and I could see from the massive smile across his face he was happy to get a good ’un. On the scales the second fish went a very nice 65lb – a common which was in immaculate condition. I could see from his manner, Oli’s enthusiasm about the week had totally changed. He was eager to get his rods back out and I could tell he knew there was a good chance of more to follow. Indeed, the following morning he was in again and, after a tough battle from the boat, at first light he was rewarded with another good common – this one just a few ounces under sixty. He was absolutely buzzing and it was fantastic seeing him in such good spirits. Despite watching Oli using the ‘one bite at a time’ tactic so well, I sat on my hands waiting for my rods to start working. I had a game plan and wanted to sit it out because I’d seen plenty of lads have nothing during the early part of the week, and then bank an absolute monster on the Thursday. As weird as it sounds, that’s how Rainbow fishes, and it’s where the now widely used phrase ‘Big Fish Thursday’ originates. No one knows for sure why it fishes like this but one theory surrounds the change over of anglers. This takes place every Saturday, when anglers arrive and start baiting up new areas of each swim. 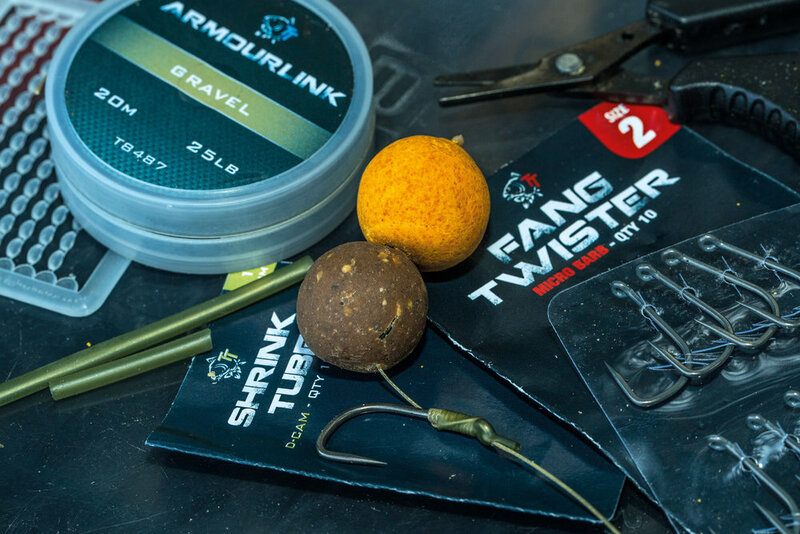 It often takes a few days for the fish to turn to the new bait because they’re still on the leftovers from the week before – with the older and wiser (and usually bigger) fish taking a bit longer than their brothers and sisters. By the Wednesday, however, my confidence of sitting over lots of bait was starting to dwindle. I’d landed a small mirror on the Tuesday which had been my only action of the week. My ‘carpy’ brain kept telling me there was something not right with my tactics. I had fish showing on my close range rods and I should have been catching more than I was. When Oli landed a fourth fish I just had to follow suite, so I reeled in one of my rods and dropped it in a new place alongside only a couple of free offerings. When that rod went the next morning with a 40lb-plus common on the end, I knew I had to move the others or I risked wasting the rest of the week. A few fish had been showing in the bays to the right so I moved two rods there, and the third I dropped down the channel closer in, putting only a couple of broken Scopex Squid around each hookbait. Twenty-four hours later I’d added four more fish to my tally, including a beautiful mid-40 common. The morning and afternoon had come to life, with two of my rods going almost at the same time, whilst Oli had popped to the shower. We’d missed getting the bites on camera but, more importantly, things were starting to happen on my side of the swim. The switch of tactics had been such an obvious game changer I knew there was more to follow on the last night. Despite neither of us having a bite all week during the hours of darkness, the atmosphere on the lake had changed as the sun dropped over the horizon. The air temperature was a lot warmer than it had been all week and, for the first time, we started to hear buzzers going off in other swims. We could also hear fish activity in front and, typically, with a long drive ahead of us the next day, it looked like being a busy night. Oli was the first to be woken from his sleep when he lost a fish on a snag. Only moments later I was up for a low-20lb mirror which I unhooked in the net. No sooner had I redone that rod, than one of my others was away with a 30lb common. My smallest fish of the trip followed a couple of hours later, with Oli losing an absolute unit on a snag at the same time. 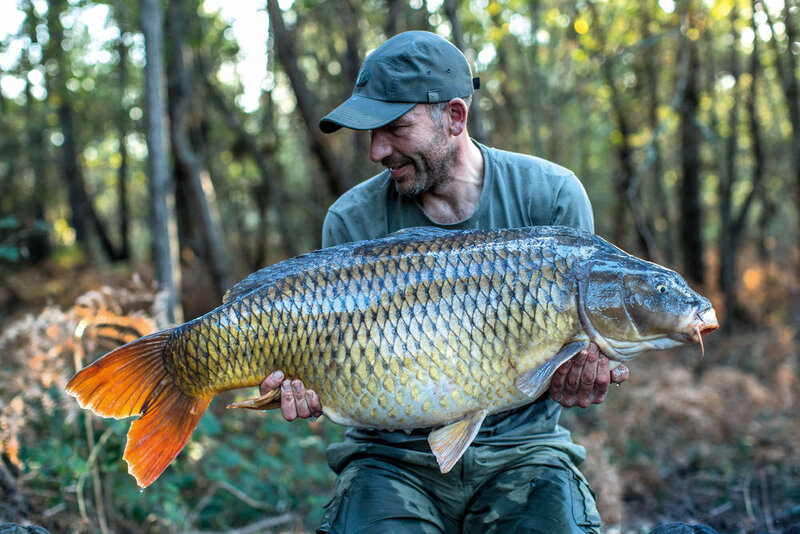 He’d done the hard bit by keeping the fish away from a sunken tree, only to see the hook pull at the net as he watched a massive common waddle off under his boat! He was totally wounded. Neither of us had a wink of sleep thereafter. If it wasn’t our own alarms or those in nearby swims keeping us awake, it was fish boshing in the darkness. It was a lovely, still moonlit night when you could hear a pin drop in the Rainbow forest. Every fish that moved sounded like it was only a few yards in front of us and they all sounded like absolute beasts! In all the years I’d fished the lake I’ve never heard the amount of big fish topping in front of me as I did on that night. I was sat on my hands just waiting for the rods to go, praying for the kind of ending we all hear about happening to others. I’d yet to catch a big fish on a final morning at Rainbow. I’d heard plenty of stories about others catching one before pack up time, including one lad having the Ken Dodd Fish (a known 80-pounder) with his rods on the floor. I kept looking at the rods as I began to pack up, wishing them to burst into life. Oli was still mumbling about his lost fish as he did the same, but when one of his rods roared off with only minutes to spare all was forgotten. I hoped for the same to happen to me, and I couldn’t quite believe it when my longest rod started to drop back just as Oli returned to shore with a nice 30 in the net. We had to juggle the boats as I headed off at full speed to see what had caused it. By the time I’d reached the middle part of the swim I could see the fish had moved a long way from where it had picked the bait up. The bottle I was using on my line to keep it up in the water was bobbing away in one of the bays to the right. My initial thought was I’d hooked a small carp because of how far it had travelled, but when I closed in on the fish and felt its weight I knew differently. Every time I go to Rainbow I aim for a fifty. A sixty is a bonus, and I could tell that my ninth and final fish of the trip was in that category, just from the way it was fighting. It was dogged and heavy, just plodding along, unlike the smaller fish which darted all over the place. When it eventually came up in front of the net, it was that long I almost ran over it in the boat! I could see from its frame it was a definite trip-maker! Back on shore, Oli looked at the fish in my net and scratched his head. He knew it was a decent one but all he could think about was the one he’d lost in the night. Mine weighed in at 61lb and he knew the one he’d lost was much, much bigger than that. He was convinced it was broader across its back, so I recalled my own stories of lost monsters to try and help him forget it. Every angler at Rainbow has something to tell. That’s the nature of the venue, the place where dreams are made and lost. As we finished the photos and filming, and began to load the gear into the van, we shook hands, smiled and nodded at one another in respect of a great week’s fishing. It had very much been a different trip to those I’d had before. Oli had a flier at the beginning with things turning in my favour as soon as I changed tactics. The Rainbow fish didn’t play ball with the big beds of bait that they’d become so used to, instead preferring the ‘one bite at a time’ approach. We finished the week with 14 fish between us and a 60-pounder apiece. It was a trip of two halves, and as we said farewell to the lake, I wasn’t just smiling about the result, I was also smiling for Oli. Whilst travelling down he’d said that Rainbow probably wasn’t somewhere he’d go back to, he’d just had to tick it off his list. Having just spent a week there and seen what it was like for himself, he was completely bowled over by it. The Rainbow bug had well and truly bitten him, and he couldn’t wait to return! Our thanks to the owner Pascal for his hospitality, Rob Hales for sorting the fishing, and to all of the lads on the lake for sharing lovely times.